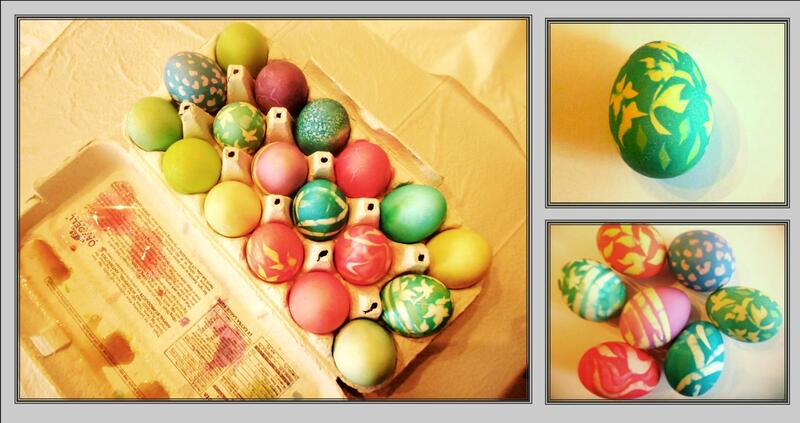 Inspired to create by…some hard boiled eggs…transforming them for the our Easter Celebration. I could go on about how lovely Spring is & what an inspiring time of year it is to see new life, all the flowers coming up out of the ground & the blossoms on the trees. The truth is Spring has always been my favorite season, well right next to early Fall, but I woke up this morning & it was almost 30 degrees & snow was everywhere. I was not the heavy kind, but the wet snow that sticks. It was quite a sight on all the neighbors white blossoming trees. Yes, I live in Utah where the weather is quite fickle so Spring & I are not speaking to one another right now. It may have been the cold & the fact that I could not find my winter coat this morning as I walked, No! Ran out the door to meet with my accountant…Frankly I was not very inspired when I faced the day & was more irritable than usual…I am not a morning person by any stretch of the the imagination. Today I was sure when I woke up I was not even going to be a April 6th person, but four hours later this all changed. Suddenly after weeks & weeks of extreme busyness trying to get ready to file my taxes & juggling my other responsibility’s I felt free! 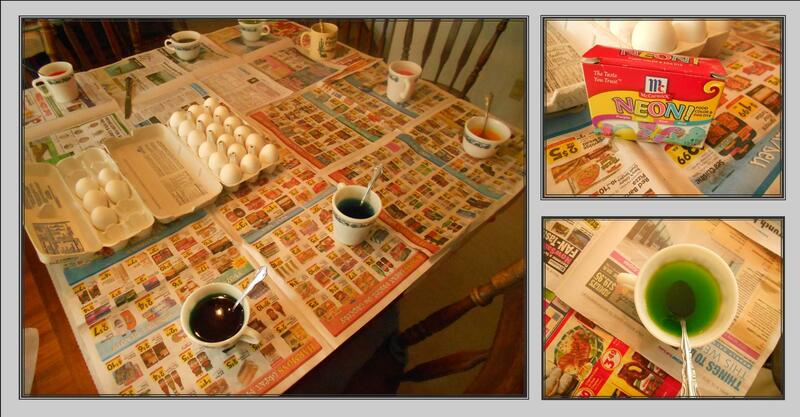 The children are on Spring break so we decided we might as well do our egg dying today. This got their cute little noses out of the books they were reading & gave us some time together. I took one look at those white hard boiled eggs & suddenly I was feeling ambitious. We were at my mothers house so we set out the dye just the way I did as a child. We put garbage sacks on the table with layers of newspaper over the top & for the dye we put one tablespoon of vinegar in each cup with boiling water & more than a few drops of McCormick brand food coloring in each cup. I put two layers of tape lined up next to each other about four wide, with each layer going the opposite direction to reinforce it on a piece of wax paper. I used blue painters tape on the bottom because it is easier to remove the wax paper off of than the Scotch tape which is firmer. Then I drew a design over it with a fine Micron marker & used fingernail scissors (my secret tool for cutting out fine detail & curves) to cut it out & then used the tip of an exacto knife to carefully remove the wax paper off the back. Now I had a way to transfer a design to the egg. I put the egg in yellow dye briefly so it would be a soft color underneath the tape. 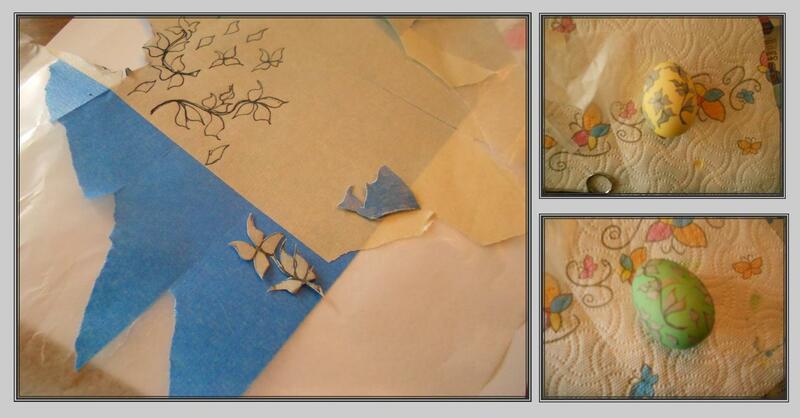 Then I let it dry completely before I applied the tape design, rubbing it softly to make sure it would not slip off. First I dipped the egg with the design in a warm green. After a bit I removed it & let it dry. Then I added a few more sticky stencils then I let it sit in the cooler almost jade green dye. The fun thing about using the tape over the eggs is that the dye will leak under it a bit…fairly randomly & when it does it gives the area a sort of tie dyed look. We all got pretty creative here but I may have gone over board. Once I get an idea in my head I have to try it. That is why I have an animal print egg & a few abstract eggs to go alone with my floral designed eggs. My children & I have not spent this much time dying eggs in a very long while. It was nice to let our creative juices flow & just enjoy a project without feeling like we had to hurry to move on to the next thing. For me doing this kind of casual design that is for no one but myself is a great way to recharge my battery so I can tackle the bigger more serious design stuff. It is as good for me as meditation. If you still haven’t dyed your Easter eggs yet & are looking for a way to mix it up a bit give this a try. I would love to know how they turn out. Happy Easter for all of you Easter celebrators!